Serengeti Masai Mara Wildebeest migration is a seventh greatest wonder in the world. It stands out very clearly in the whole world. Masai Mara in Kenya and Serengeti in Tanzania makes travelers come to Africa time and again. It is a spectacular involving mass movement of wild animals roaming free through unspoiled and savage wilderness of Kenya and Tanzania. You have not seen something like this before Africa is changing at a quick pace and human encroachment into the wildlife reserves has continued to erase the traditional routes. In association with development and changes of the way of life, the image of wildlife roaming free is slowly getting erased. Fortunately, Masai Mara National reserve in Kenya and Serengeti national park in Kenya holds on to this charisma of an open, limitless land. It is one of the places in Africa that still prides in wildlife concentration. Masai Mara is located in the South-western part of Kenya, 290 kilometers from Nairobi. The abundance of wildlife and the remoteness of the reserve implants memories that no money can buy. The Migration is a recent phenomenon (60's and 70's was the biggest boom) with about 250,000 individuals. Gradually, with time the number has risen to the current population of over 3,000,000 individuals. Add to it an estimated 1,500,000 Zebras and the result is one of the most magnificent scenes in the world. The massive display attracts hundreds of big cats as the populations provide abundant prey. The giant African crocodiles lie in wait, patiently, as the big herds come to cross the river or to drink. It is the Masai community who are not so pleased with the whole phenomenon. 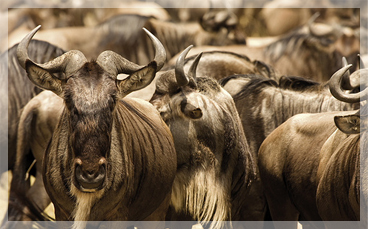 The wildebeests compete with their huge herds of boran cattle for the grasslands. To them, it is a big calamity especially because the wildebeests transmit diseases to their herds and poison the waters with their fetal sacs. This world famous migration is a circle of life which, in simple terms, means that there isn't a start or an end. Only where the herds are located at a particular time. The big determinant is the availability of pastures. The plains of Ngorongoro Conservation Area in Serengeti are a favored spot as grass abounds and the wildebeest find a safe place to graze. It is also here that over 500,000 new calves are born and many are taken by the nearby waiting Jackals or hyenas. New born migrating animals have little time to strengthen their legs. As soon after birth, the “pilgrim" continues. By April, the rains are over in southern Serengeti and the plains have dried up. The great herds then gather and face the long march northwards and westwards. The natural lawn mowers abandon the exhausted grasslands of southern Serengeti to head for the already tall grass of the Western corridor, near the shores of Lake Victoria. The pioneers of the migration movement are the majestic herds of zebras. They prefer the long stems of the coarse grass. This way, they leave behind shorter grass which is favored by the wildebeests. In late June to July the mass start pouring into the Kenya Masai Mara reserve where fresh, tender and mineral-rich grass is already waiting. Here they meet the resident Mara populations which add up to about 150,000. Also commonly referred to as the Loita plains herds, they spend most of the season northeast of the Mara. When it gets dry, they pour into the interior of the Mara in search of greener pastures. The migrating herds spend roughly 3 to 31/2 months in the Mara crossing through Sand River, which is a tributary of the Mara along the boundary of Kenya and Tanzania. They trek westwards and cross the Mara river and sometimes the Talek river. Usually around this time heavy rains on the Mau Escarpment (origin of Mara River) fill the Mara river to the brim. 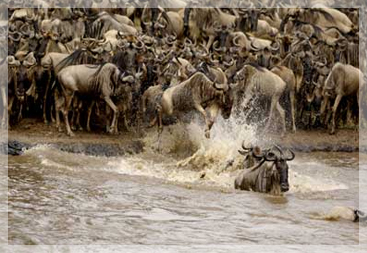 Finally, the gnus (wildebeests) venture into the river. This gregarious coordinated behavior of the herds, usually teamed with zebras, antelopes,gazelles and other plains game create an unimaginable scene. The Wildebeests wander along the river looking for a convenient crossing point. This is a moment filled with tension for both the wildebeests and the audience. They survey for a less steep and with no obvious danger. Finally, one takes courage and plunges into the river and magically the rest falls onto the footsteps and in one organized line cross the river. In addition to the crocodiles, accidents also occur. The river’s current can be too strong for some especially the young ones. Or simply getting stuck between the rocks in the river and breaking limbs. Finally, the crossing is done and the trek to their unknown destiny continues. In October, they head to Serengeti for southern grasslands, green carpet of rich grass. Once again, they are heading to the southern plains, where a new generation will be born to start the cycle of life all over again.